Visiting Rodanthe on Hatteras Island yesterday I stood on the narrow dune that separates the oceanfront from Highway 12. Four months now since Hurricane Sandy passed by, two months since the road and the dune were repaired. Yesterday there did not appear to be much difference from one side of the dune to the other. I've got a four day weekend starting tomorrow and I wish I could say I will get out on the water. The highest forecast temperature will be 52 degrees Friday, then down to the mid-40's for the next three days, so no sailing (I like to have 60 degrees at least for the first sail on chilly waters.) But I do hope to get a lot done over the weekend, everything from wiring the new trailer lights to cleaning out and repacking Spartina. 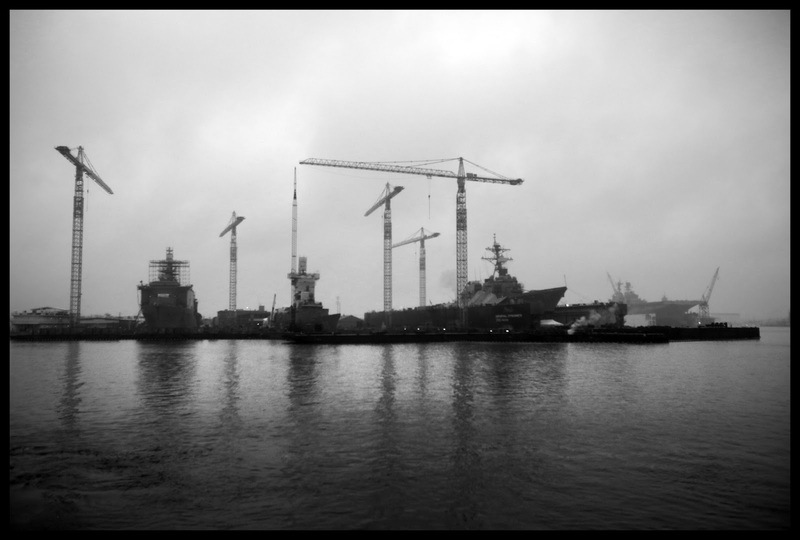 And most importantly I hope to raise the new sails for the first time. This evening I marked our waypoints heading north in Chesapeake Bay once we round Cape Charles. It was just a handful of waypoints - the concrete ships at Kiptopeke, the Harbor at Cape Charles and a couple of creek inlets. There are a series of creeks all the way up the bayside of the eastern shore, well marked and offering plenty of protection every few miles up the coast. I was surprised when I measured the distance from Cape Charles to Tangier Sound, it is barely 50 miles. We have done that much in a single day (with good wind and helping tides) and we can easily do that in two days (famous last words). 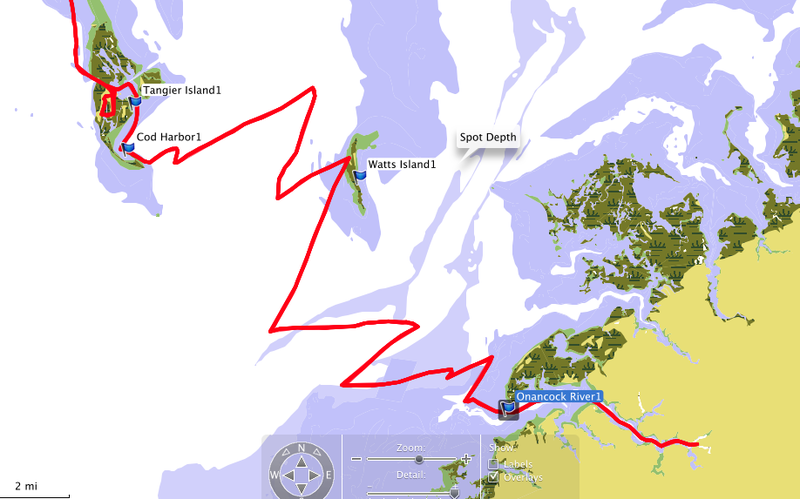 The circumnavigation will be complete once we cross this track between Onancock, Watts Island and Tangier Sound. We've got a total of eight days to make the trip south from Chincoteague on the seaside then north on the bay side. Should we complete it in less time than that we plan to use the extra days well by visiting Tangier and Smith Islands, enjoying crab cakes, soft shell crab sandwiches and that seven layered cake they bake in Tylerton. A big thanks to my Mom (Thanks, Mom!) for the new boat shoes as a birthday present. 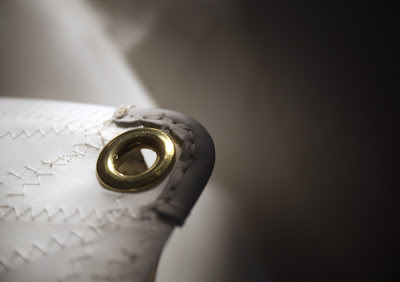 She has been nudging me to get some boat shoes since I wrote about the first day of the Tangier walkabout last spring. The temperature was in the mid-forties and I found myself out there on the water with no shoes (who needs shoes on a boat??). These Vibram Fivefingers (shouldn't it be Fivetoes??) 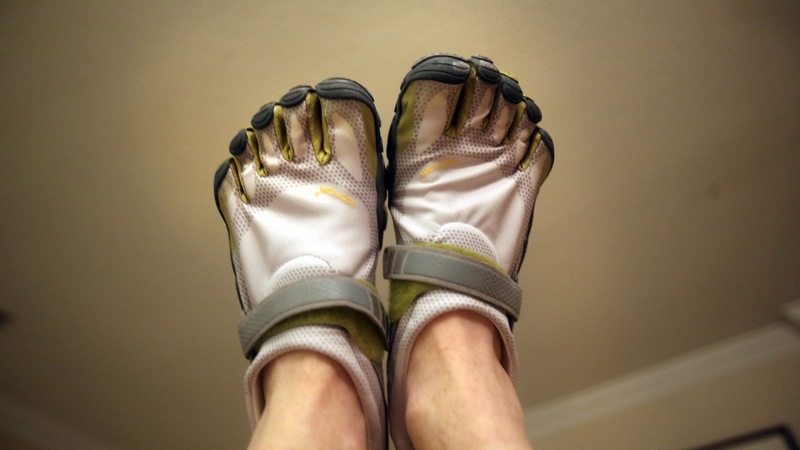 Bikila Sports Shoes would have made it more comfortable. They really aren't mean for warmth it would have been nice to have something between the soles of my feet and the cold deck that day. Afternoon temperatures in the 40's are an exception for the month of May. I suspect where the shoes will be most useful is on those windy, spray filled days when the wet deck becomes slippery. These shoes have nice rubber soles that will help me keep my footing. It is always good to have Mom watching out for me. Is this what they mean by "elbow room"? There was just enough room to get the bow sprit hardware back on Spartina today. 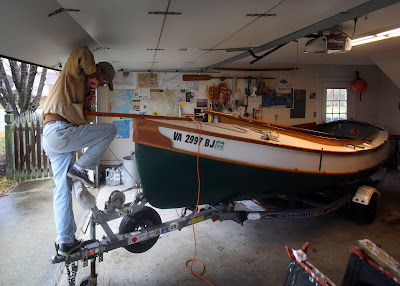 It did rain all day, as forecast, but the temperature was warm enough that I could open the garage door, angle the boat in the two car garage and get some work done. 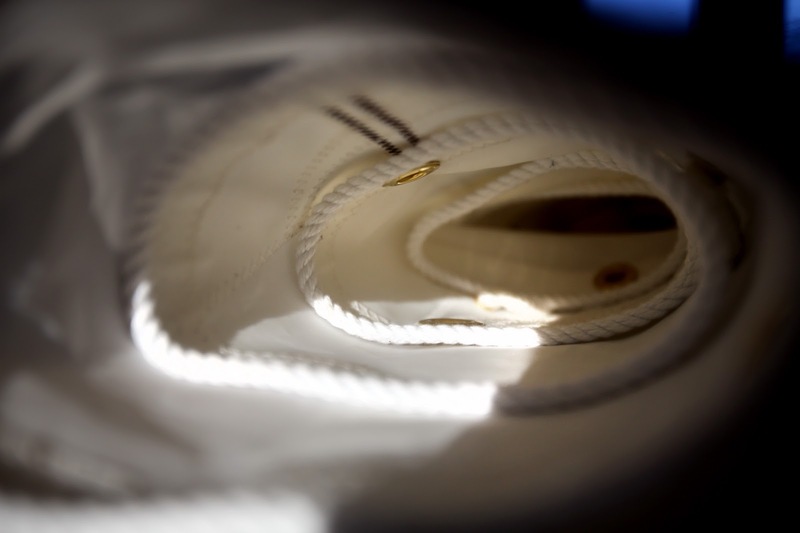 Above is the diamond base pad eye for the forestay. You can see that I drilled out the old screw holes, tapped in mahogany dowels then predrilled into the mahogany to reset the #12 screws. I would have thought that the wood beneath the diamond pad and other hardware would be darker that the exposed douglas fir, but it was the other way around. Most of the hardware is now back in place. 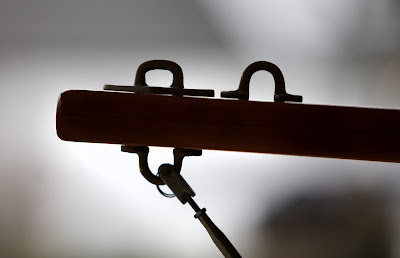 The jib sheet fairleads, the mizzen sheet fairlead and the inverted hooks for the boom tent will go on next weekend. Mentioning the boom tent reminds me that I need to order some three inch wide polytarp tape to do a little patching on the tent. I also sanded and painted the upper planks on both sides of Spartina. She looks about as nice or maybe a little nicer than the day she was launched six years ago. 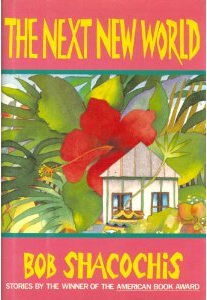 I just received a "used" book of short stories, The Next New World by Bob Shacochis. His first book of short stories, Easy in the Islands, is one of my favorites (but I will admit that I struggle with his full length novel Swimming in the Volcano). This "used" book, a hardback, appears to be brand new. And now that I flip through the pages I see that it is an autographed copy dated May 7, 1993. Not bad for a buck. With stories titled "Let Femmes Creols: A Fairy Tale", "Squirrelly's Grouper" and "I Ate Her Heart" I think this will be a good read. Cold and grey today. Too cold. And I'm tired of winter. Tomorrow warmer temperatures are coming up from the south, but along with the warmth comes rain. Should we escape the rain I might roll Spartina out of the garage, raise the masts and fasten on the new sails, but that most likely will not happen. 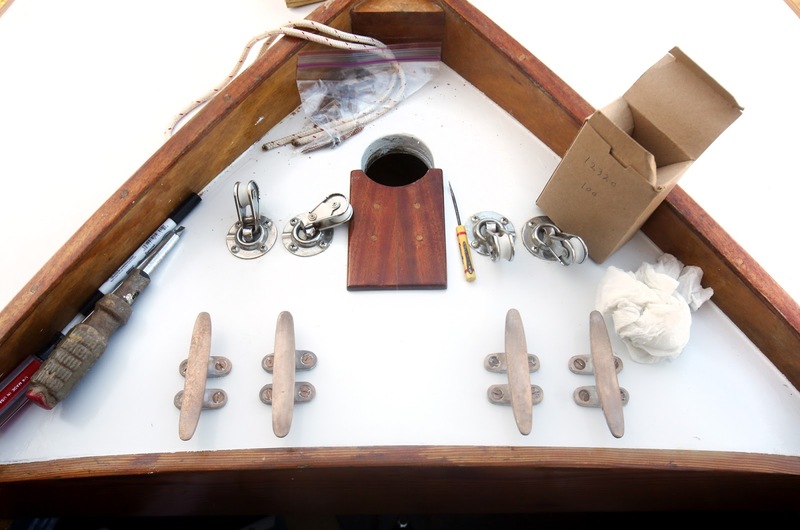 Above you see the mizzen as I start looking at hardware and line needed for the new sails. And thanks to oyster farmer Chris Ludford of Pleasure House Oysters for using some of the photographs I shot last summer (scroll down on the "farm" page and you will find them). The Lynnhaven River recovery is an incredible story. 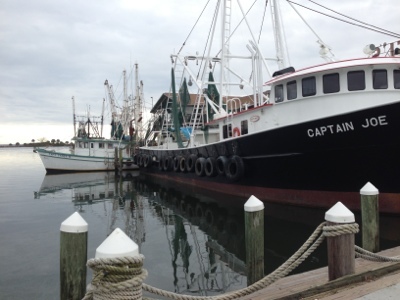 For four decades Lynnhaven oysters, because of pollution, could not be harvested. But after a lot of work by groups such as Lynnhaven River NOW, the river is now producing healthy, wonderfully salty and sweet oysters - both wild caught and farm raised. I was glad to meet Chris and see his operation. And I have enjoyed the oysters he produces. They are just great. Sometimes it is as easy as it looks. I've stood on the docks at Harbor of Refuge, the commercial marina at the south end of Chincoteague Island, and watched the path of the flowing tide head out to the ocean. 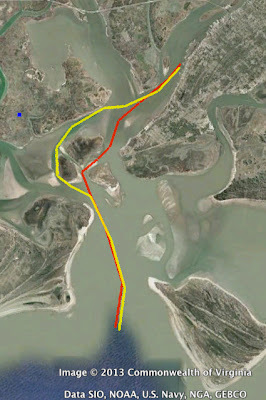 That's the way we would go in Spartina - slide down the channel from Chincoteague, turn south at the harbor and follow the markers out to the Atlantic. But looking at a couple of different charts and google earth had me confused. 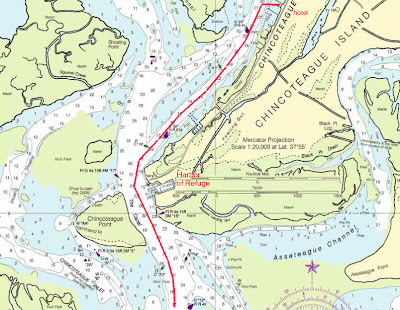 One chart showed the marked channel cutting through Chincoteague Point, the marshy area across from the harbor, and then south. 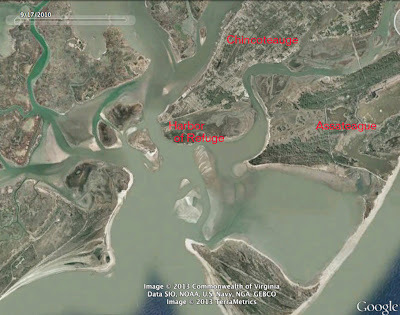 Google earth showed the deeper channel going behind Chincoteague Point. But finally the NOAA chart, detail below, shows that the obvious way, the one that I saw standing on the docks, is the right way. We should have a nice tide carrying us out on the first morning of our trip. 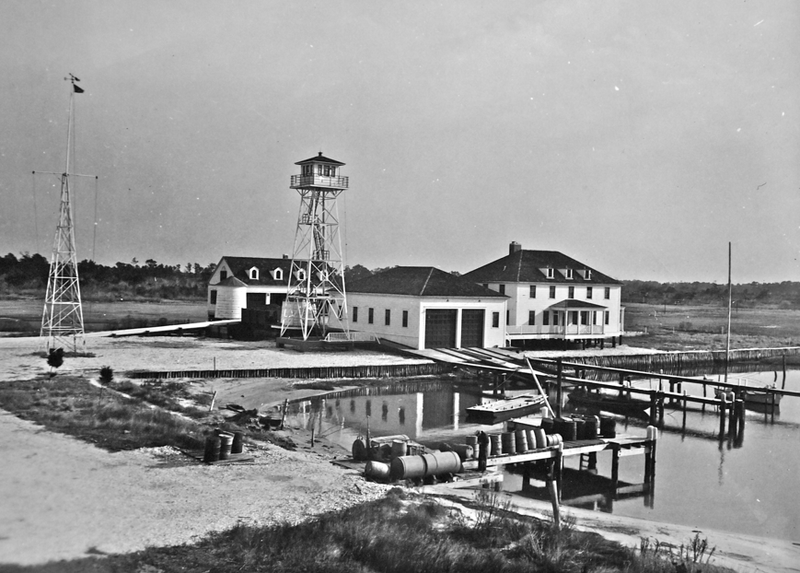 A little more research tells me it was Wachapreague Inlet where Washington Tuttle came inside after leaving Chincoteague. 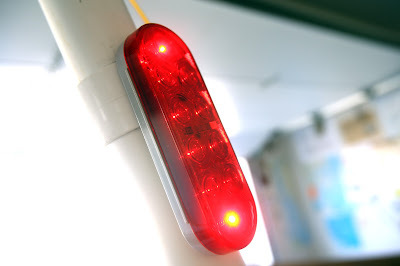 A Coast Guard website matches Tut's description. Searching google earth is was easy enough to find the site of the old station from the description above. 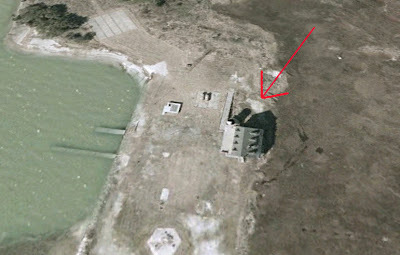 The one thing I don't understand is the date, which the Coast Guard site shows was abandoned in 1940. Maybe that is a typo. Tut's circumnavigation was, I believe, sometime in the 1970's or 80's and he definitely mentions the Coast Guard Station and talking with the "chief" there. 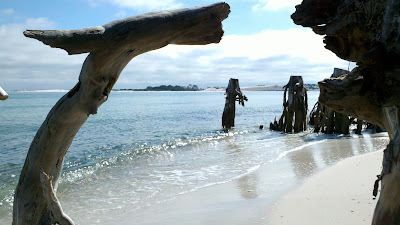 And I can hardly believe that the military would abandon a coastal station in 1940 with German U-boats just offshore. Looking at the google earth image of the old station I can now see that most of the structures are gone. But the building at the back with the four dormers, the round structure (water cistern??) 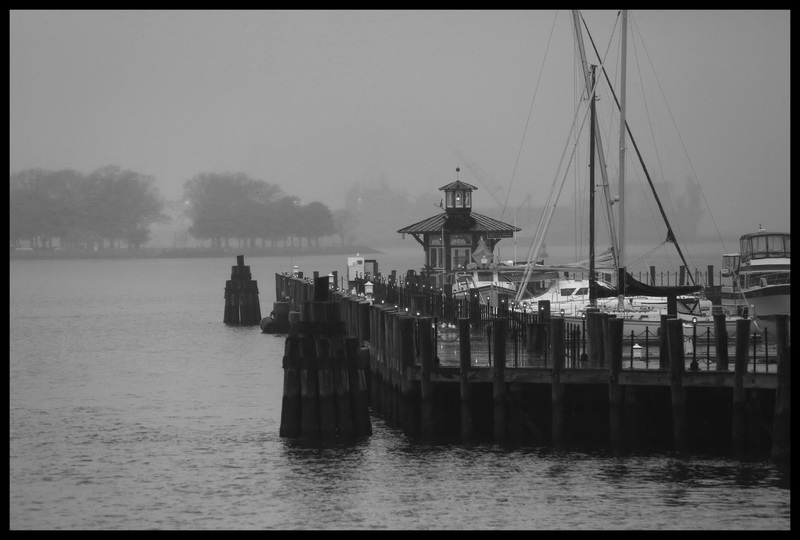 and a couple of docks still exist. Maybe we'll tie up at the docks and have a look. 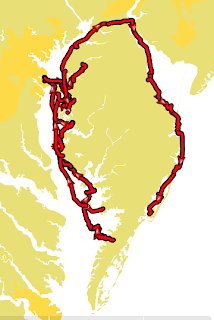 Washington Tuttle's account of his Delmarva circumnavigation is less than clear when it comes to his path from Chincoteague South to Cape Charles. He left Tom's Cove at Chincoteague to sail outside on the ocean. The transcript of Tut's accounting says "I sailed all day. 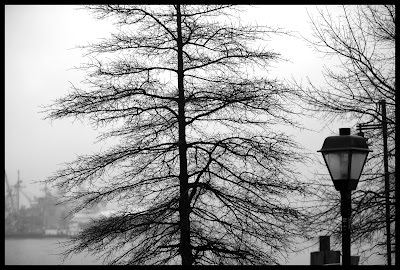 Late in the afternoon I found a small harbor. 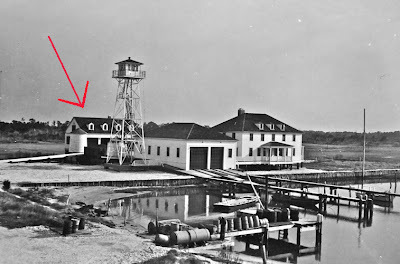 There was a Coast Guard Station on Anismas. I anchored across the creek a hundred yards from the ocean." I cannot find anyplace on the Eastern Shore called Anismas. I suspect Tut told the interviewer that he anchored near a Coast Guard station on "an isthmus." 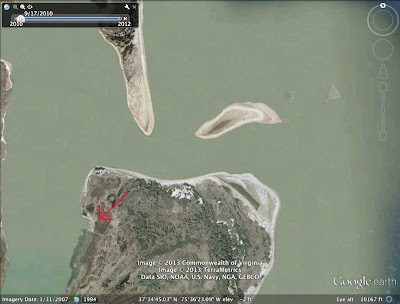 But really it was not an isthmus, it was the tip of a narrow barrier island. 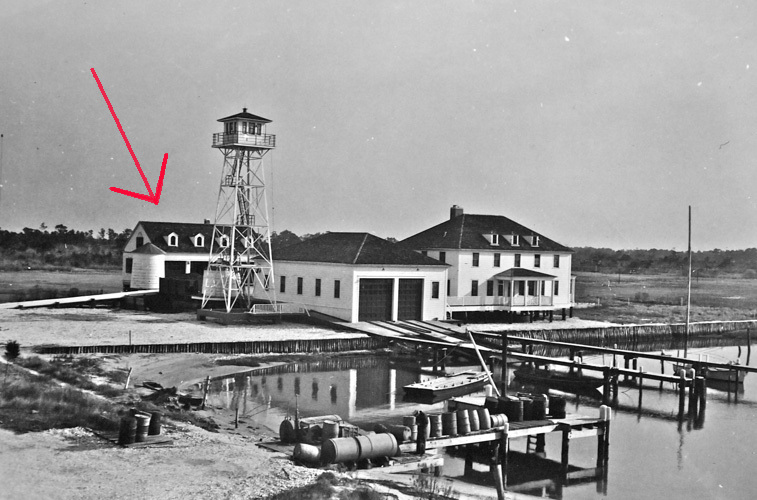 And possibly the station was the old Parramore Beach Coast Guard Station, above, at Wachapreague Inlet. The Coast Guard chief told Tut that it was "six or seven miles" to town, which would be about the correct distance from Wachapreague Inlet to the town of Wachapreague. From Anismas Tut sailed outside for another day, coming back in through an unidentified inlet to the fishing village of Oyster. 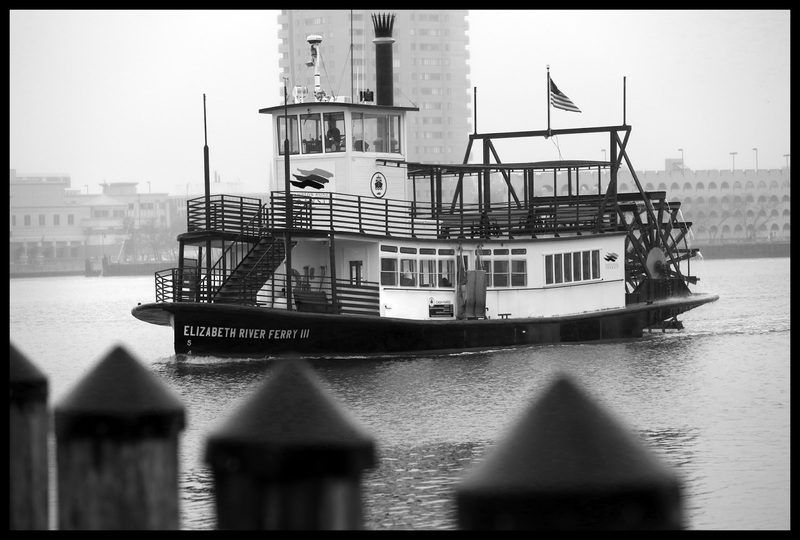 From there he sailed inside the barrier islands to Cape Charles, the southern tip of the Delmarva Peninsula. 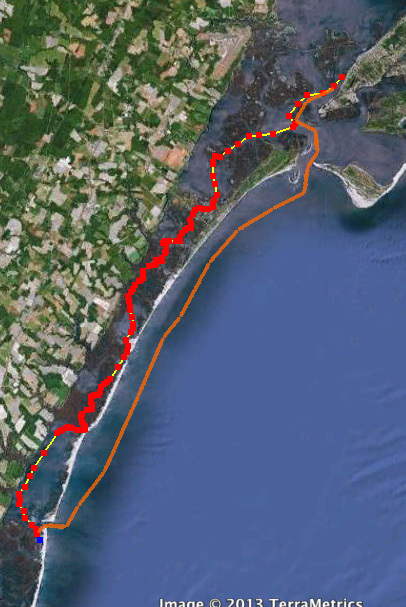 It was more work than I expected to place the waypoints for the second day down the eastern shore barrier islands. Regardless of which chart I used - Garmin Blue Chart, the printed Virginia Barrier Islands map or google earth - the channels were hard to follow. Sometimes there was not much of a distinction between channel, mudflat and marsh. Some channels meandered off into the marsh, then reappeared a short distance later. Some channels were lined with markers, some had no markers at all. It could be an interesting trip inside the islands. 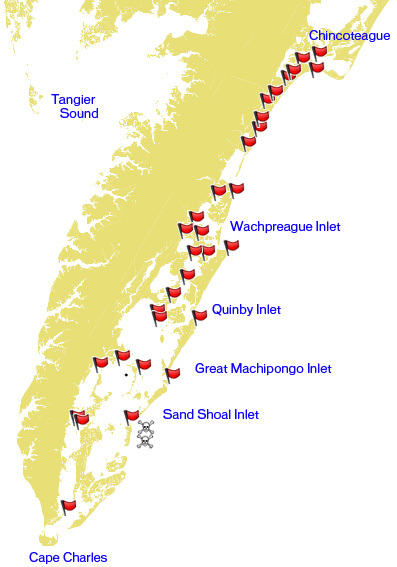 Should we sail "outside" on day two, leaving out of Wachapreague Inlet, I see there are three inlets to get back inside the barrier islands. 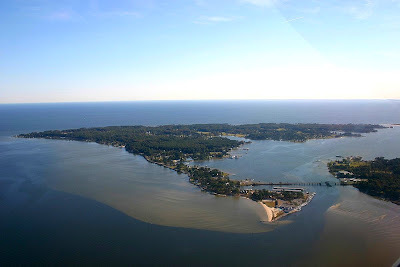 From north to south they are Quinby Inlet, Great Machipongo Inlet and Sand Shoal Inlet. You can see that there are two waypoints with skull and crossbones markers near Sand Shoal Inlet. These are waypoints marking shoals where there are breakers. After a closer look at the chart I see there are shoals outside of each of the inlets. I need to go back and mark those shallows too. I plan on spending quite a bit more time looking at the Eastern Shore charts and google earth. Ideally I hope we follow Tut's general path - two days outside, the third day inside. We'll see. I do want to be familiar with the narrow channels, particularly up north, if we have to go inside. While I had the gps connected to Garmin HomePort on my laptop I experimented with importing tracks of past cruises. Above you can see three of our sails - The Crabhouse 150, Back to the Islands and Over the Top 200 - overlaid on the map of the Delmarva Peninsula. There is not that much left to complete the circumnavigation. 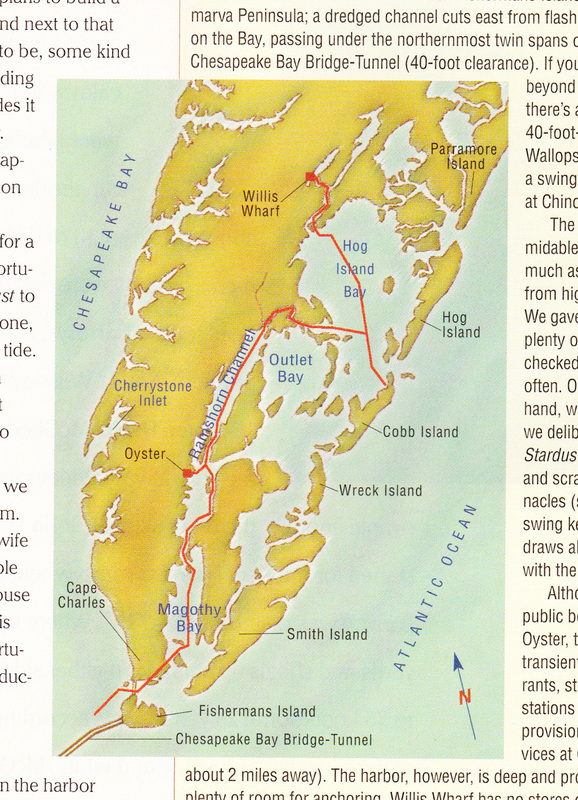 I just found this nice map from my friend Paul's trip behind the barrier islands of the Eastern Shore. 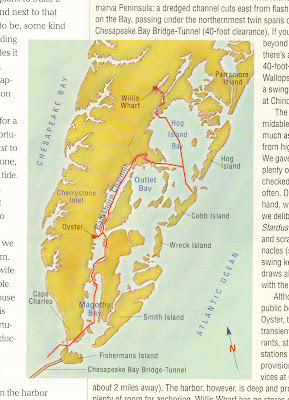 He wrote about the trip a few years ago in Chesapeake Bay Magazine. I'll use this map tonight as I put in waypoints for the second day of sailing down the shore. Some of our sailing will, weather permitting, be outside of the barrier islands, but some will be inside. I'll have a closer look at the inlets this evening when I connect the gps to my laptop and look at the Garmin bluechart for the area. Now that I can see the light at the end of the tunnel called winter I need to start planning a little more seriously for the spring cruise. Below you will see the two options for the first day of the trip down and around the southern end of the Delmarva Peninisula. The day would be from Chincoteague to Wachapreague Inlet. Our preference would be to go outside and sail down the coast on the ocean. For that we would need a nice breeze from somewhere out of the north, anywhere from northwest to northeast. 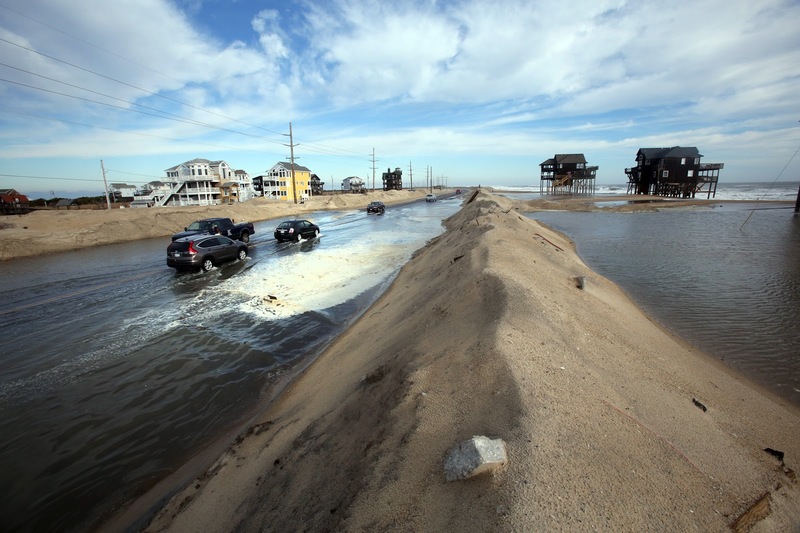 If the ocean is too rough or should the wind be out of the south we'll need to go inside of the barrier islands, a tangled series of channels and cuts through the marshes that would most likely involve motoring. Going inside would be scenic no doubt, those marshes are beautiful. But sailing on the ocean just off the beach pretty spectacular. Creating a series of waypoints I noticed that leaving Chincoteague is not as simple as I had thought. I have stood at the edge of the harbor at the south end of the island - Harbor of Refuge it is called - and thought it was a straight shot out to the ocean. Not so, I now see. 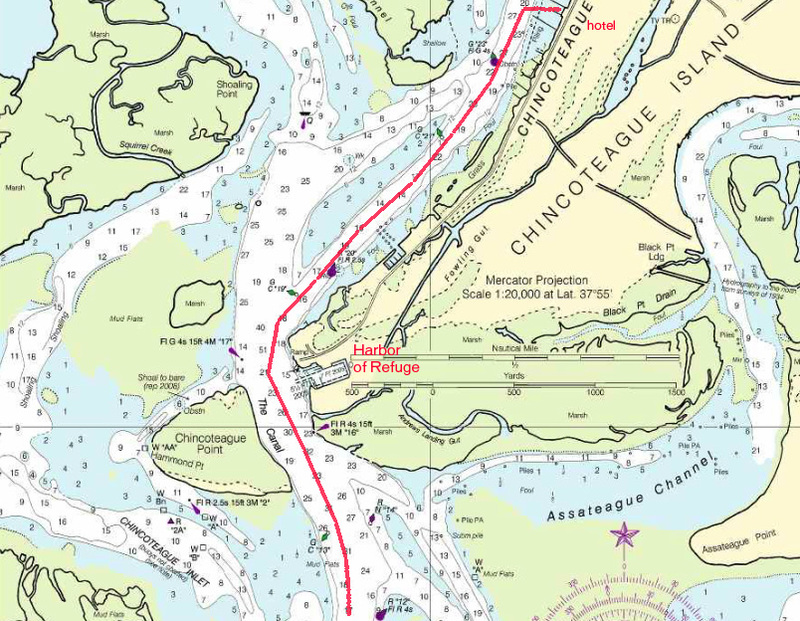 The navigational chart shows the red track above, one that cuts through the island/mash marked as Chincoteague Point. That cut, though, looks very shallow and I have to wonder if it would be better to circle behind the marsh and go out on what appears to be a deeper channel. I need to research that some more. 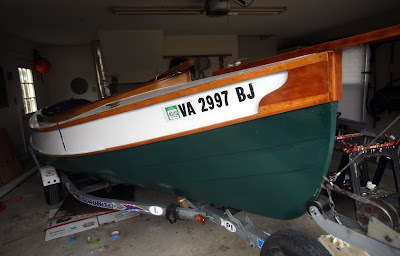 After a final coat of varnish Friday evening, when both the sun and the temperature went down quicker than I wanted, I found myself ready to start putting the hardware back in place. 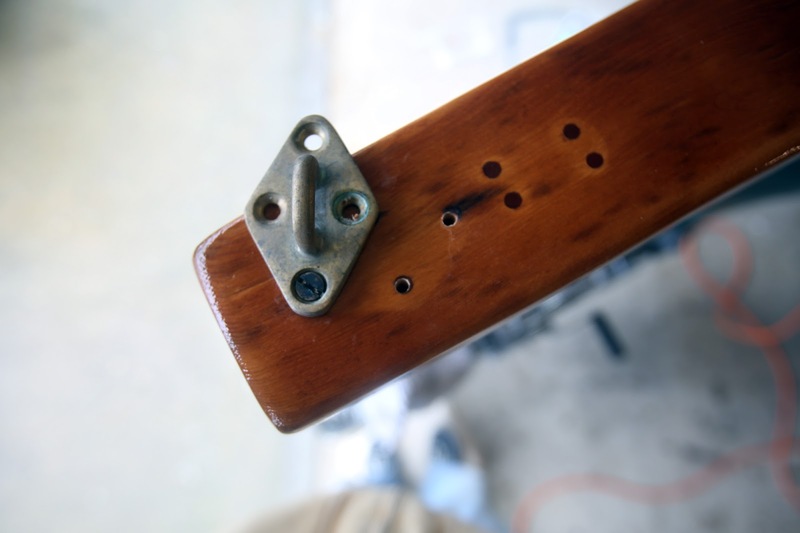 I have to say if felt very good to drill into the mahogany plugs and drive the silicone bronze screws into place. Spartina is starting to feel like a boat again. 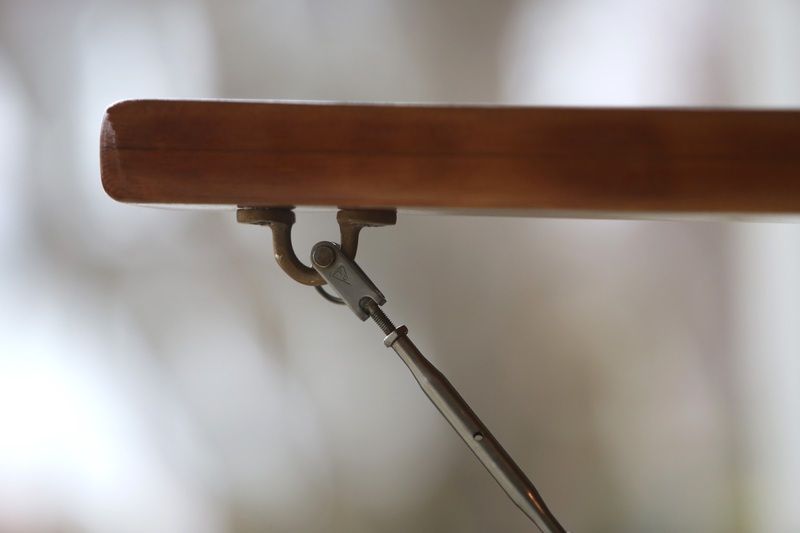 I just put a few pieces in place - the bow cleat, above, and the fitting (don't know what to call it) for the bobstay, below. I had several more pieces to put in place but the rain and the wind and, eventually, the snow arrived. Adding the rest of the hardware will be a treat I'll save for this coming weekend. The bigger treat may be raising the new sails for the first time. Yes, the light at the end of the tunnel. I can see it now. 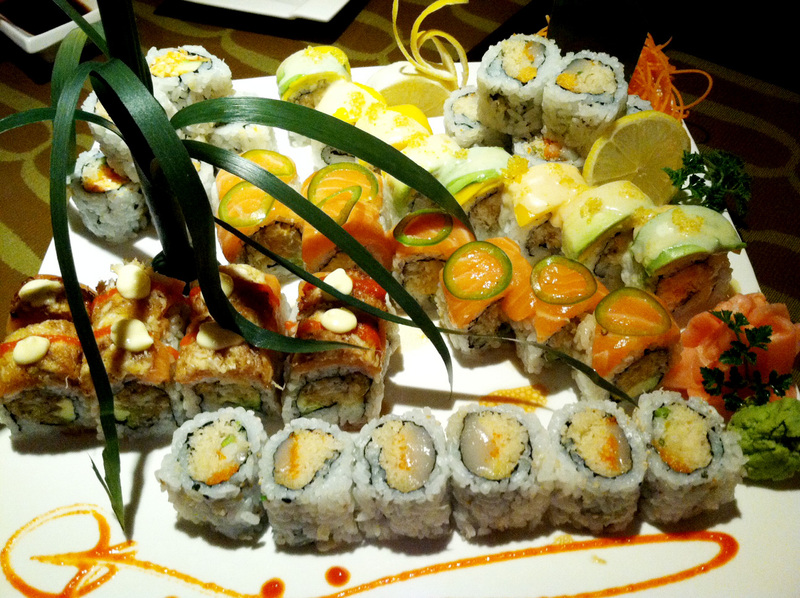 Spicy scallop roll, spicy California roll, seared tuna, ceviche salmon roll and a few others....I lost track. The place used to be called "Haru", now it is called "Haniki". Call it whatever you want, it's pretty good. 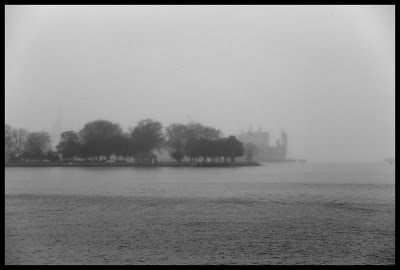 Fog and drizzly rain, I took a ride across the Elizabeth River on the ferry this afternoon. They caught me going round trip so I had to pony up another six quarters for the coin machine to get back to Norfolk. if I had my ducks in a row.. If only I had finished the painting, had all the hardware back in place, raised the new sails and adjusted the halyards then I might be out sailing this coming friday. 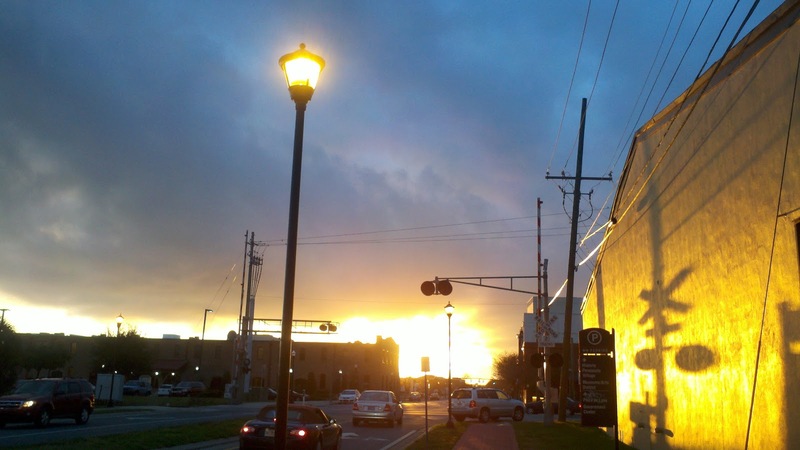 The forecast is for over 60 degrees, sunshine and light winds. But it's not going to happen. The nice day will find me sanding, varnishing and installing hardware. 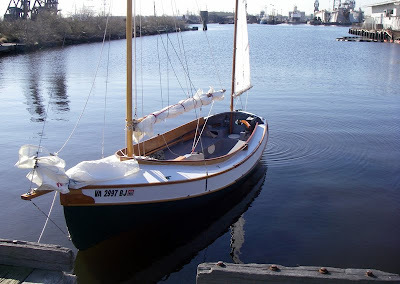 I've always wanted to do a late February sail, getting out there on the water when the south wind carries in a few nice days that give hints of the coming spring. 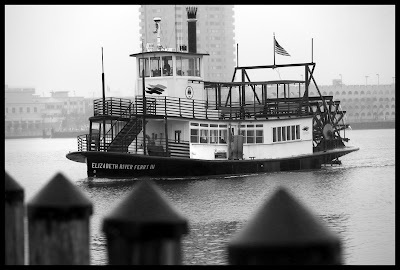 But it always March - typically mid-March - before Spartina's hull slides into the Elizabeth River. 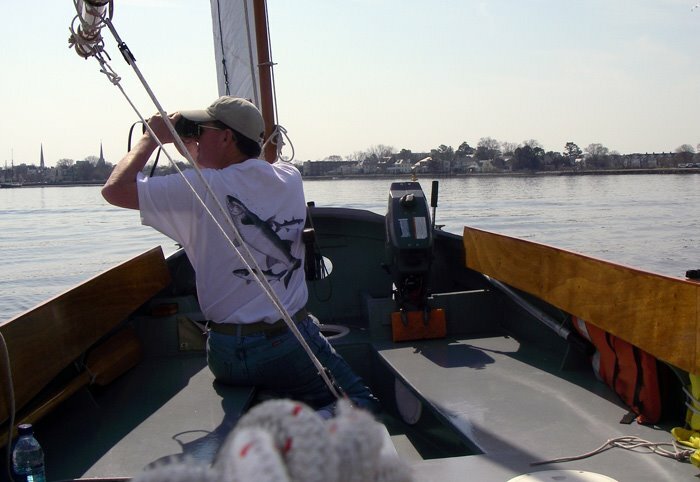 The top photo is from year's first sail on March 19 of 2010, a cloudless day with light winds and 70 degrees. March 7 of 2009 found me out on the water in a tee-shirt for the first sail - I can remember that day like it was yesterday. Light winds, plenty of sunshine. Last year we - Spartina, my youngest daughter and myself - got out on the river on March 18. There was a little more wind than forecast, but perfect for a nice sail down the river to the James and then back to pick up the daughter. 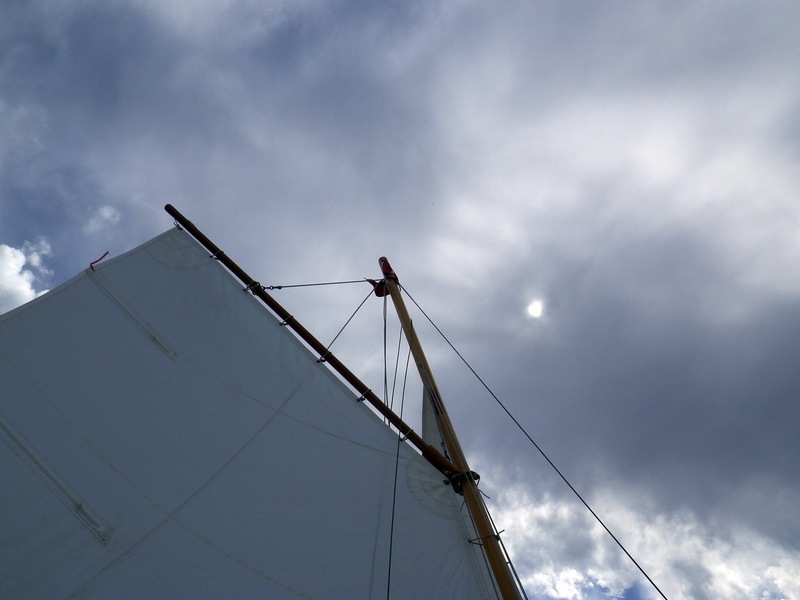 It was an overcast morning of sailing on March 13 of 2011 but with a warm breeze out of the south. By late morning the skies cleared and a stiff wind had me tucking a reef into the main. Reading back through the blog posts from each of the first sails I find the recurring themes of trying out new gear - a compass, gps, or camera - and trying to remember how to rig the boat. I do know how to rig Spartina, but sometimes I forget the order for most efficiently reeving the lines, raising the masts and bending on the sails. So it takes a little bit more time at the ramp. But that's ok, that first day on the water makes it all worthwhile. So I won't make a February launch this year. But I suspect that first sail can't be too far away. Instead, looking at my list of winter jobs I experimented with the new trailer lights, something I had put off because I don't enjoy running the new wiring harness through the frames of the trailer. But with the old harness wires, a couple of bits of string and a coat hanger I was able to run the wires. 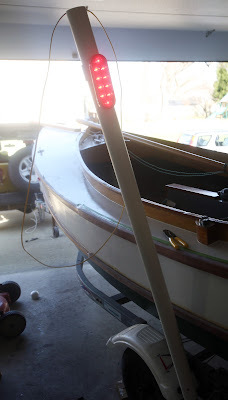 These lights will be mounted high on the trailer's guide posts where they will be both more visible and hopefully longer lasting as they won't be submerged in salt water when launching and retrieving the boat. I still need to work on the pvc guide posts and finish the wiring with wire caps filled with silicon sealer. That should be an easy afternoon job that I'll get to after I'm done painting. And I have always wondered why I had the 100 count box of #12 silicon bronze screws in tool closet. 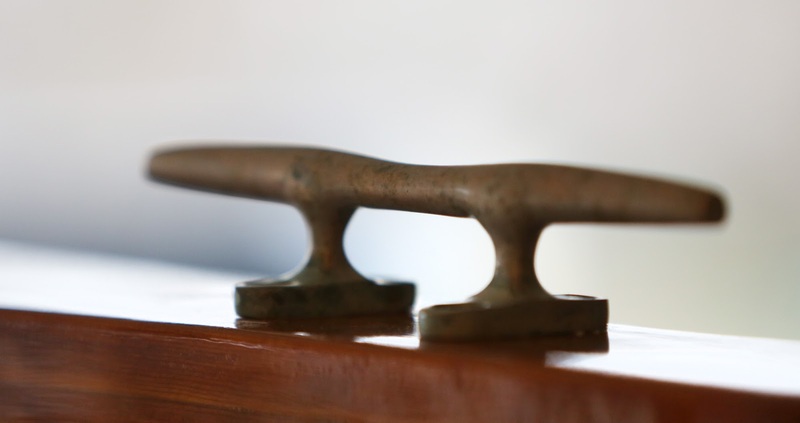 I found out today as I put the old dock line cleats on the foredeck as halyard and topping lift cleats. 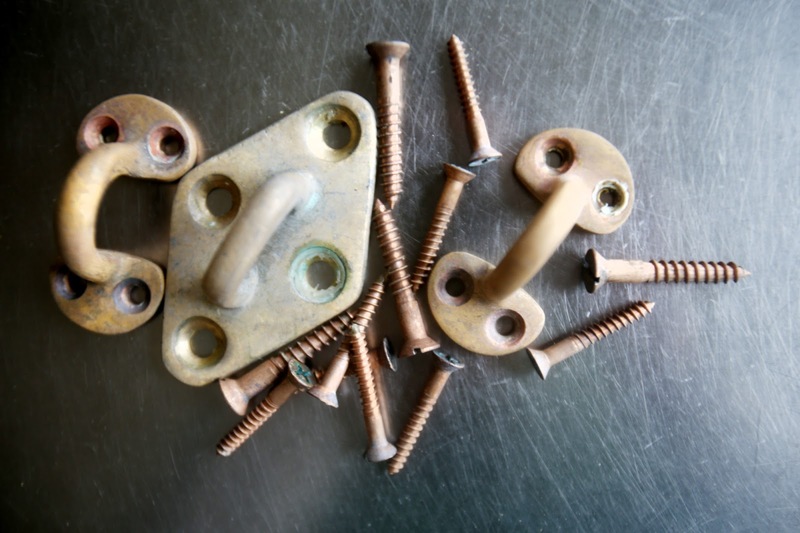 A lot of the old screw were in rough shape and I was happy to find the one-half full box of brand new screws without having to run to the hardware store or, worse, West Marine. Three weeks to meet my early March deadline for being ready to sail - give me a couple of warm days for painting and I'm there. 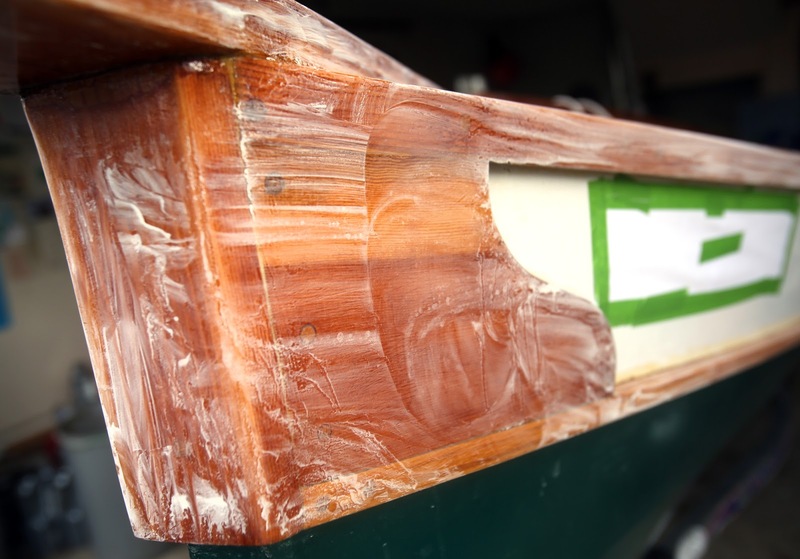 No, not the blizzard (and I'm just calling it the blizzard, not the fake name cooked-up from the weather channel), it's the fine residue left by wet-sanding the varnish. 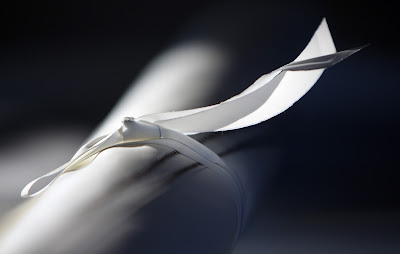 I've since wiped it off with a damp paper town. It was too cold and windy - very windy - today to varnish. I'll try to get the coat on tomorrow. I did pick up the new wiring harness for the trailer as the new brake lights need to be rigged and mounted in the next week or two. And I said farewell to the old sails, shipping them off to Sea Bags at the suggestion of sailing friend Bill. 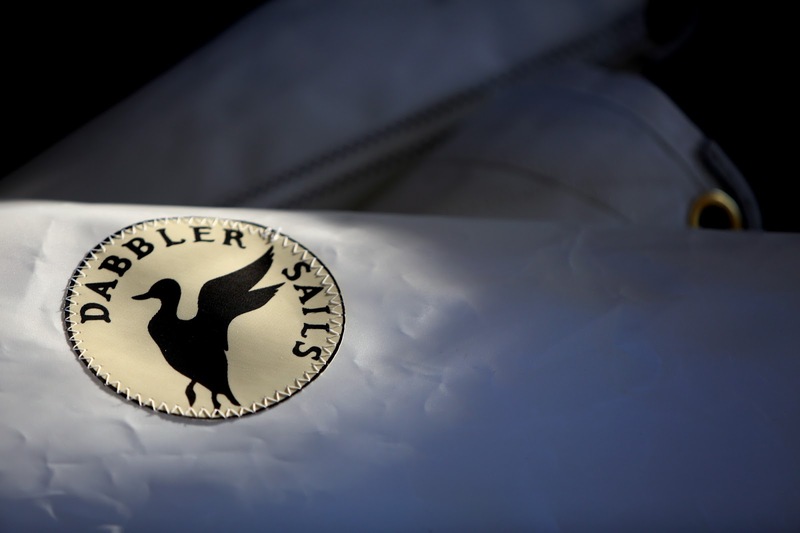 Located on an old wharf in Portland, Maine, the company paid for shipping the old sails which they will recycle and use as material for nautical themed bags and totes. You can see some of their products here. Once they get my sails they will tell me how many bags or items they will give me in exchange for the sails. I don't know what to expect in return, we'll have to wait and see. 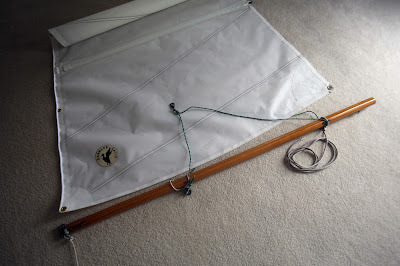 But what else was I going to do with a set of old sails? Waiting at the airport after torrential downpours this morning. It is clearing here now, but it seems we will be following the weather system moving up towards the mid-Atlantic. I do hope the weather is warm enough tomorrow for the sixth winter coat of varnish tomorrow, but only after a good sanding with 400 grit wet paper. I am still frustrated with the iPad blogger app. It will only upload low resolution photographs. And I need to start carrying something better than a cell phone for a camera. But I liked the light. On the gulf coast for a few days. I spent a lot of time here from the 60’s on. This will probably be my last visit for a long time to come. We are staying at a hotel near the waterfront and the convention center. There's a Jimmy Buffet show at the convention center tonight. We'll be watching out for Parrot Heads. Update....took a walk along the bay to the marina. 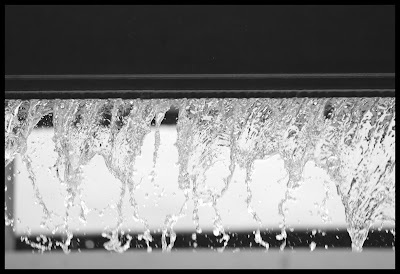 Sometimes a light grey overcast, sometimes sunny, then a light spitting rain. 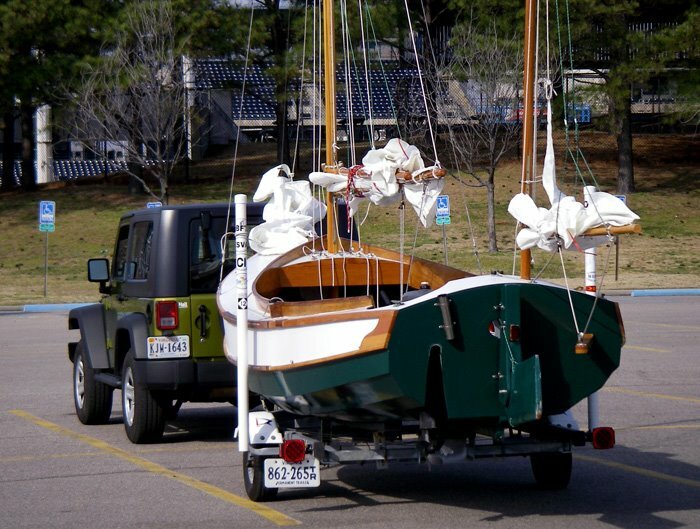 Watched one expensive sailboat motor into an almost empty marina. Buffet fans all around wearing Hawaiian shirts and drinking beer (and this is five hours before the show starts). I like the music just fine, but I've also heard that drinking a lot before the show makes the live performance sound better. 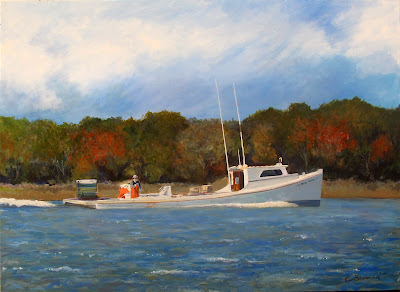 Here is a nice new painting called "Headin' In" from friend and maritime artist Curt. The white hulled deadrises with crews in orange slickers are constant companions while sailing on Chesapeake Bay and seeing this work boat - does it have a name, Curt? - brightens my day. On this chilly winter day I'm thinking about the coming spring, but this painting with the fall colors in the trees reminds me how quickly the sailing season seems to pass. I'm now looking forward to the first warm days in late February or early March, soon it will be time for the spring cruise in May, then come the hot afternoon winds of summer and finally the fall cruise with the colors of Curt's fine painting. It all goes by so quickly. 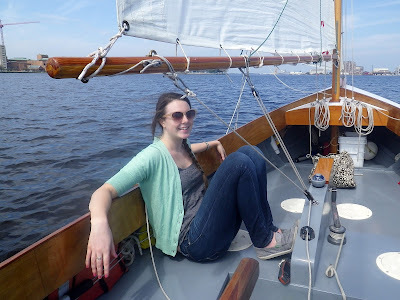 Early last summer I was emailing John Welsford, Spartina's designer, about something and as an aside thanked him and everyone else south of the equator for sending the sun my way. 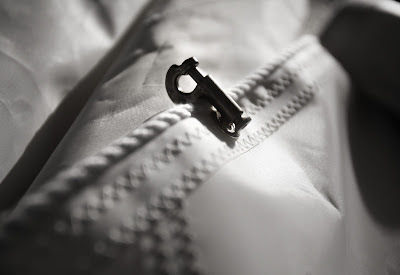 In a reply he reminded that they had only lent it to me, I would soon have to return it. Yes, too soon. Curt's post with the new painting also mentions Gwynn's Island where he will be moving his Drascombe Longboat "Annie" and includes the photograph above. Seeing this makes me wonder why I've ignored the western shore of Chesapeake Bay for so long. That's something I will have to remedy someday. Thank you Stuart and Dee.